All of that is why I haven't been able to post as much as I'd like. I'll also be travelling a bit before the school year and will probably be a bit loony and stressed once I start my job... but hang tight, I'm still here. In the meantime, I know how you all love my protein oats recipes (here and here), so here's another! Only this time, I added a special ingredient... chia seeds. 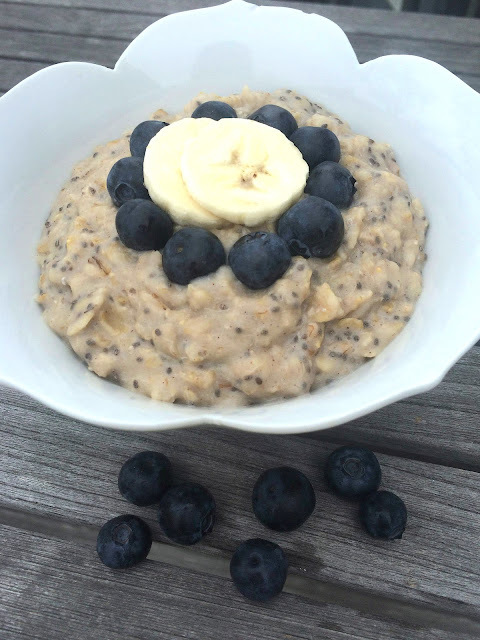 Chia seeds can be added to so many recipes and they are great for you. High in protein, fiber, and omegas, they are a powerful little seed. The cool thing with chia seeds is that they form a gelatinous-like coating when wet. For example, my skinny chia seed pudding gets its thick texture from the chia seeds. No eggs or cream needed. Egg whites and chia seeds give this hearty oatmeal the perfect custardy texture while adding protein and fiber to keep you feeling full until lunch. Add any fruit of your choice for a healthy super-breakfast. 1. In a small saucepan, bring almond milk, water, salt and banana to a boil. 2. Once boiling, add oats and turn down heat. Simmer for 5-6 minutes until most of the liquid has been absorbed. 3. Turn off heat and stir in egg whites whisking constantly and immediately. Doing this will ensure a fluffy consistency rather than scrambled egg pieces. About 1 minute. 4. Remove from heat and stir in cinnamon, vanilla, and chia seeds. 5. 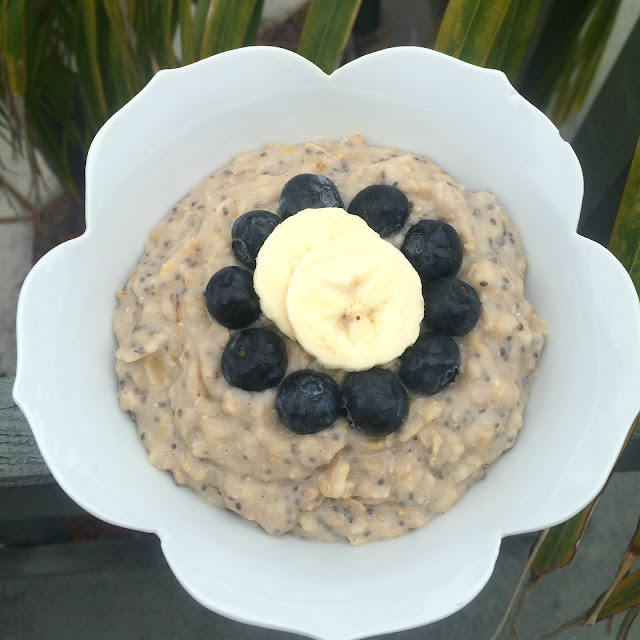 Pour oatmeal into a bowl and add blueberries, bananas, or desired toppings.